Just a note: the “Permissions” tab of the “Page Info” dialog already has this site-specific preferences UI, not much different from Alex’ mockups. 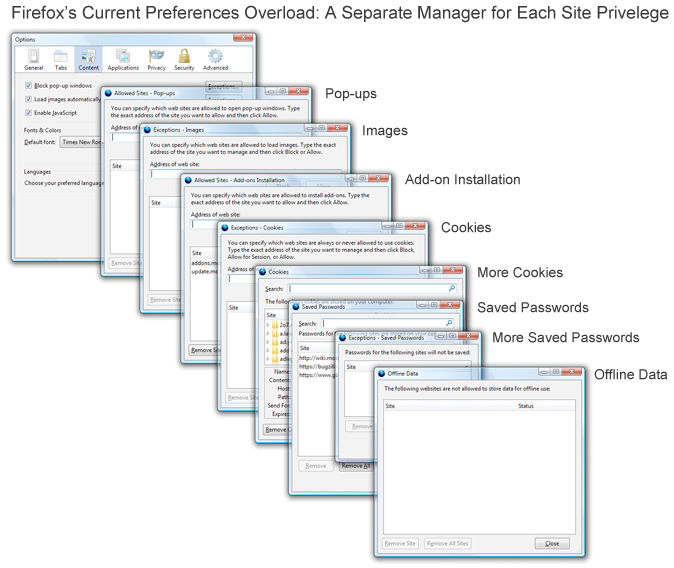 Not all users can find this dialog of course and it does little to provide an overview or restrict third-party cookies. So having something similar on the global level would be great. I thought this was the domain of the “Page Info” window, in particular, the Permissions tab which currently allows users to set Images, Pop-ups, Cookies, Extensions & Location preferences per domain. Non unique user agent strings? how about linking to a wiki that discusses individual sites re: privacy so a user could “get privacy info” when they’re on a site? Another big problem is that we have a cookie manager, but nothing for things like DOM Storage, which can be used to re-establish cookies, Flash based storage options, or ways to make fingerprinting browsers harder. Cookies are just one of the vectors to ID a user based on simply browsing. Those are terrific ideas, and Mozilla is in a unique position to lead on privacy tools that are available directly in the browser, where they need to be. We maintain this index by regularly spidering the top several thousand websites for new ad network domains, and monitoring privacy policies for changes. At privacychoice.org you can also see our Firefox add-on that enables permanent opt-out status across hundreds of networks, and blocks ad-network Flash cookies. We also are about to release new functionality to selectively block access entirely to ad networks based on privacy practices and certifications. To the extent these databases and tools can be helpful in crafting enhanced privacy protection for Firefox users, we would be pleased to donate their use for your efforts and provide any learnings we have that can be useful. I can be reached at jim (at) privacychoice.org. Cookies need to be namespaced internally so that the cookie doubleclick sets when included on mypage.com isn’t the same as the cookie doubleclick sets when included on otherpage.org (or the cookie it sets when I visit it directly, god forbid). The current “block third-party cookies” setting is useless; it doesn’t prevent doubleclick from setting whatever cookies it wants on whichever page, as long as the page includes an http request to the doubleclick domain. Never came across a site that requires third-party cookies to work, first thing I disable on a fresh profile and allowing them is imho a very bad default. At least Firefox doesn’t allow first-party cookies to be read in a third-party context like Chrome does. Not very hard to circumvent, but at least it requires some effort on the website/tracker side of things. Add flash cookies, local storage etc. and the whole affair gets impossible to manage with any browsers built-in tools (even after the proposed changes you’d need addons). Opting-out via cookie is particularly stupid, just trash everything at a sessions end and keep a list of exceptions for sites you want to stay logged-in at. I LOVE this new model — having all of these choices available on a single page will help people not miss something that concerns them. In addition to making options less cumbersome to set, this also provides a very handy reference sheet of the issues people should have in mind when they think about their online privacy. I thnik better would be iphone like switch for on/off option. Back in the day, cookies were a big concern and there was a lot of hype about privacy. I stopped worrying about cookie privacy a long time ago. If a primary concern is targeted adverting, what’s the big deal? I’m not so weak minded that I’ll fall prey to whatever is being advertised. You are much better off implementing an ad control feature, to prevent the loading of content from Websites other than the one I’m viewing, so I don’t have to view the advertisements at all. This has an added security benefit as well. Never had a problem with blocking third-party cookies on any sites. I think you need to measure how many sites would be affected by just having the default set to block them. I never actually see any advertisements so that aspect isn’t relevant but tracking is. Its amazing the amount of sites that try to piggyback on the the main site you are visiting. Looks good; certainly would be clearer for blocking advertisers that I have no need for. Hopefully the option to group by type of access will remain – it is useful to be able to look at all sites with geolocation access (for me, none), for example. This a great design direction: site centric. It certainly is more powerful and a more user friendly idea and design. It puts users in control rather than firefox.. I know I would probably use all that more if it was like the design rather than the way it is.. its too much work the way it is to maintain. I say go for it. How would it be able to handle 3rd party information tied to main site? 1) Keep cookies from some selected domains. 2) Delete all other cookies when closing the browser. One might think that Firefox has all necessary options to achieve this but (BIG but) setting exceptions for specific domains will allow cookies to be send and received in both first- *and* third-party context. For instance, ff I set Firefox to mark all cookies as session cookies but want to keep being logged in into Facebook and therefore create an exception for this domain, Facebook will also receive its cookies on all other domains which embed anything from Facebook (e.g. the almost omnipresent Facebook widget). But actually I want the cookies only to be send and received when I’m on facebook.com itself. I also like the idea of namespaces for each domain though I guess this would have to be examined thoroughly for more or less subtle breakages. Bank e-bill payments to some companies won’t work if you don’t allow third-party cookies. And the Disqus commenting system requires third-party cookies (and they tell you so). Other than those two, disabling “Accept third-party cookies” has worked fine for me for decades. It would be great if Firefox announced “We’re disabling third-party cookies by default in 4.0” and forced companies to proxy requests to the companies they get to do their dirty work. Hmm if Apple can do this why cant we? Safari and Chrome do not fully block third-party cookies. They will not accept cookies from third party domains but if any cookies from these third-party domains are already present they will *send* them anyway. For instance, if you are logged into your Facebook account and go to foo.com which has a widget from facebook.com, Facebook will still receive its cookies despite third-party cookies being allegedly turned off. Firefox and Opera though offer true third-party cookies blocking and will neither send nor receive them. 1/2 a loaf is better than none. But I would like All third-party cookies blocked by default if at all possible. If there are a small number of sites like banks that need it put them on a white list. But put them on notice that this is not good practice and will be dropped at a later date. Also some measurement is really needed, who may sites? How many users? It could be a none problem, i.e. very few sites and users. @SilverWave There’s plenty of sites that third-party cookies break. Many of those seem to be just poor design… using third-party cookies when they’re not needed. It’s unfortunate, but for sites as important as banks I think we need to do whatever we can not to break them, even if their design is poor, it’s their fault, etc etc. Also, I’m not sure how many banks would improve their design just for Firefox. More likely, they’d tell their users to just switch to Chrome. Fair comment if its that widespread. But then… how does Apple’s solution not cause issues for them if that is the case? Or is it just that Apple is prepared to take the hit? Nice article,keep up good work. IMO, third party cookies should be disabled by default. This seems like a big security hole, and should only be turned on when a user allows it for a specific site. What is the legitimate reason to allow them? The article says that most bank websites require them, but I haven’t found this to be true? I use Bank of America and have never had problems related to my disabled third party cookies. Thank you for making the honest effort to discuss this. I believe very robust approximately it and wish to learn more. If it’s OK, as you gain more extensive wisdom, would you mind adding extra articles similar to this one with additional info? It would be extraordinarily useful and useful for me and my friends. This article was published one year ago… Nothing new concerning third party cookie handling within Firefox ?